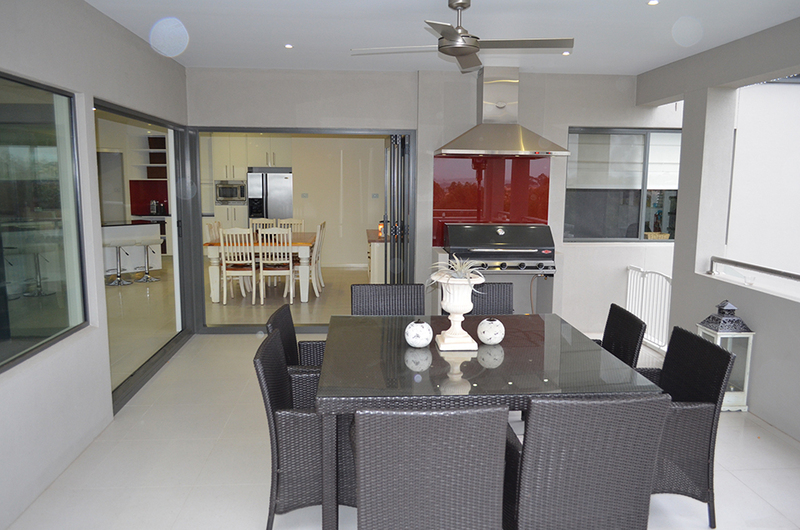 Our client’s brief was to remodel their home to provide functional living, modernise its elements and construct an outdoor place to entertain in style. Additionally, they wanted to give their teenage daughters a space of their own. The children’s retreat was designed so that the rumpus room was sacrificed for a bedroom and walk in robe, the other room to be built underneath the extension. By using the laden storage space in the subfloor, we were able to allow for a fantastic walk in robe that apportioned space for the children’s own outdoor area off their bedrooms. To make the room functional the family room pushed out onto the existing small porch. This provided space for the corner bi-fold doors with careful integration of window heights and placement for furniture. We created an open roof to the alfresco to maximise the solar access to the family room while designing the spacious outdoor living environment. Minimal vertical elements let the morning light stream into the living area. The clients are thrilled with the outcome as their home now completely reflects their initial objectives and these attributes are clearly evident from the moment one enters the home. On completion the home is more modern and beautifully integrated both internally and in context with the clients’ love of entertaining. Build Professional was proud to deliver this outcome to our clients on time and on budget.